Pictures dating back to 1889 have been discovered at a National Trust property in Cornwall. 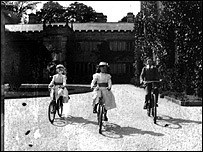 The black and white pictures show children from the Agar-Robartes family who spent their childhood at Lanhydrock House near Bodmin. The celluloid negatives were discovered in the attic of the house in February by a group of volunteer archivists. They show the children playing, bicycling, picnicking, posing and feeding their family dog. The pictures of the children are very different to the 8,000 traditional and formal photographs in Lanhydrock's collection. Paul Holden, the house manager at Lanhydrock, says it is a rare glimpse into the informal side of Victorian life. "It's a privilege to glimpse such a personal insight into the life. The children are happy and at ease and portray an innocence rarely captured on film," he said. Lanhydrock House was built by the Robartes family in the 17th Century and has 910 acres of woods and parklands. It remained in the family until 1954, when it was given to the National Trust.